Most great companies enjoyed years of obscurity before their great results compelled the world to look at them . In fact, they seemed just like any other company until a certain 'transition point' saw them leave the pack behind. These leaps into greatness did not occur through revolution. Contrary to popular opinion, these firms did not get in an expensive new CEO to turn things around. (This, in fact, is the mark of a mediocre company.) And although the remarkable results of great companies sometimes make it look like their success happened quickly, the 'leap' only happened after years of effort, what Collins calls 'pushing against the flywheel'. The American drugstore chain Walgreens is an old company which for four decades followed the general market in its performance. Then, in 1975, the company left the 'average' and began its remarkable success. From 1975 to 2000 it outperformed the stock market by 15 times, the much-lauded General Electric by five times and the famed Coca-Cola company by eight times. What accounts for the sudden and sustained rise out of mediocrity? Jim Collins began a five-year research effort to find out. Of the list of 11 great companies he came up with, whose inclusion was based on superior performance for at least 15 years, Collins says, "a dowdier group would be hard to find". It included Fannie Mae (a mortgage finance house), Gillette (razors), Kimberly-Clark (nappies/diapers, paper towels), Kroger (discount supermarkets), Philip Morris (cigarettes, chocolate, coffee) and Pitney Bowes (back office equipment). What themes did Collins draw from the research? Collins was not really interested in leadership when he began the study. He wanted to get away from the 'great leader' complex of many businesses where it is thought that bringing in a dynamic leader will transform everything. He did in fact discover that leadership is extremely important, but the type of leader that makes for greatness was the surprise. Great-company leaders are an unusual blend of ambition and humility, "more like Lincoln and Socrates than Patton or Caesar". Such leaders do not seem outwardly ambitious, because they channel their drive and determination into securing the long-term success of their company. They are reluctant to talk about themselves, instead pointing to other people who have made a contribution. These leaders also share a passion for the products their firm create, however commonplace. For instance, the Gillette people, mainly because it excited them, sunk $200 million into developing the Mach 3 razor, a great success. They are in it for the future greatness of the company. Because they put their firm first, these 'level 5' leaders as Collins calls them ensure that whoever succeeds them is likely to be just as effective, if not more. In contrast, executives of the comparison companies wanted their personal record to stand out, the more so if they picked weaker successors. Level 5 leaders intentionally keep a low profile, "ordinary people quietly producing extraordinary results". Making fortunes through selling their shares to takeover artists or leverage buyouts, it is hardly worth saying, is unthinkable. They are in it for the future greatness of the company, even well beyond their tenure. Many kept offices in the building long after retirement. Conventional wisdom has it that if you want to start and build a great company, you develop the concept to perfection and then hire the best people you can find. Collins and his team, though, found that when the executives of good-to-great firms began their corporate transformations, they worked seemingly in reverse: "they first get the right people on the bus (and the wrong people off the bus) and then figured out where to drive it." The benefits of this approach: if you have the right people from the beginning, they will be able to adapt to any changes in direction or strategy. You will not have to motivate them because they share the desire to achieve greatness, and therefore are already motivated. Interestingly, the great companies pay no more than the merely good; remuneration is not a big factor in motivating people when they have something larger than money to aim for. Finally, great companies have cultures that are 'rigorous but not ruthless'. Rigor means that everyone knows the standards they and the firm must live up to. If they are not met, they know they must go. Ruthlessness, on the other hand, is a characteristic of the merely good companies. With little thought, they will hack off whole divisions through 'restructuring' and sack thousands of workers through top-down decisions. Such a climate of fear is inherently unproductive and de-motivating, whereas great companies have an esprit de corp that challenges everyone to be their best. They know, as Collins puts it, that "Great vision without great people is irrelevant." Great companies are set apart by their reliance on the facts in making their decisions. They do not rely on management fads or heroic dreams of greatness to achieve their goals, instead engaging in continual self-assessment. Collins found that charismatic leaders can often get in the way of a company's greatness, because the staff start to refer only to "what the CEO will think" instead of data being the basis for decisions. The best companies want the truth to be heard, whoever speaks it. They have a culture of questioning and openness uncorrupted by obsequiousness to rank. Collins quotes Winston Churchill: "I had no need for cheering dreams. Facts are better than dreams." Churchill was also famous for his attitude of 'never surrender'. Great companies also have this combination of believing they will prevail in the end, while being willing to face up to the difficult reality. Great companies have a single idea or a focus which guides everything they do. Such concepts may take many years to refine, but once in place can generate enormous success because they are so differentiated. Walgreens has as its self-defining concept the best, most conveniently located drugstores, with high profit per customer visit. WellsFargo didn't try to beat Citicorp or Bank of America to be the biggest global American bank. Instead, it focused on being a very profitable bank with a focus on the western United States. Collins has a 3-circle model to test for greatness. The first circle is awareness of what you can be the best in the world at. This involves a realistic appreciation of your abilities; it is not about letting your ego run wild. Neither will it involve simply what you are competent at; what you have been doing for years may not be what you can be great at. The second circle is what drives your economic engine i.e. where exactly your profit comes from in the most abundance. The third circle is passion: very simply, doing only what you are deeply passionate about. If you can find something that you really can be best in the world at, that you love doing and that makes you money - you have the beginnings of a great enterprise. If you have two out of three, you are likely to be merely successful, not great.The book is worth getting for this chapter alone, as you can apply it to your life as much to the organization where you work. What is it exactly that you stand for? Can you sum it up in a few words? If not, your current efforts are likely to be scattered and lacking energy, just like the 'merely good' companies. Technology was rarely mentioned as a major factor for success by executives in the great companies. It was never a case of 'this technology will make the company', more like 'we could use this to take us further with what we are doing'. Other companies chose technology for technology's sake, but the exceptional companies only invested in cutting edge ways of doing things when it matched up with their larger vision. Collins' assessment is that "technology by itself is never a primary cause of either greatness or decline." The wise use of technology, however, is part of great-company culture. Good To Great was researched at the height of the 'new economy' mania. Collins says of these years: "We entered a remarkable moment in history when the whole idea of trying to build a great company seemed quaint and outdated." Having a 'culture of discipline', one of the key characteristics of great companies that he identifies, did indeed seem old-fashioned. It turned out that these firms had become great not through being 'in the right industry at the right time', but had identified their unique strengths and worked relentlessly to capitalize on them. This conclusion is remarkably similar to that reached by David Landes inThe Wealth and Poverty of Nations, who found that while geography and natural resources (chance) certainly affected the development of countries, what made them prosperous was their culture of effort and enterprise. Before Good To Great, Collins wrote the celebrated Built To Last, about visionary, iconic companies that have stood the test of time. As the recipe book for hoisting yourself to an initial stage of greatness, Good To Great is actually the 'prequel', Collins says. The value of Built To Last is that it can show you how to how to stay great. Collins says he doesn't think of his work as necessarily about companies or business. The principles of good-to-great can apply to any sort of organization, and he openly says you can apply them to your life. 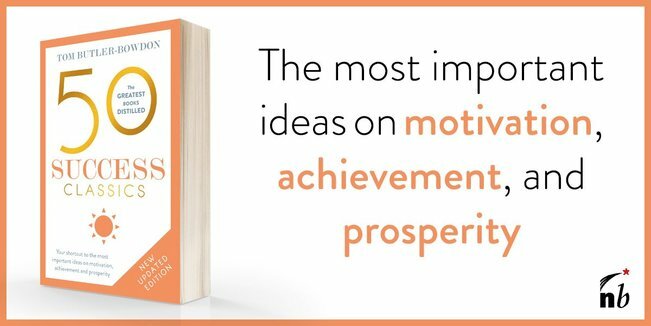 You may be surprised how inspirational these books are; the excitement is in the knowledge that success can be measured and its lessons applied methodically. With both books you will have a well-researched foundation for success that puts results before charisma. "No matter how dramatic the end result, the good-to-great transformations never happened in one fell swoop. There was no single defining action, no grand program, no one killer innovation, no solitary lucky break, no miracle moment. Rather, the process resembled relentlessly pushing a giant heavy flywheel in one direction, turn upon turn, building momentum until a point of breakthrough, and beyond." Collins heads a 'management laboratory' in Boulder, Colorado, which studies companies. He is on the faculty of the Stanford University Graduate School of Business, and has previously held positions with McKinsey & Company and Hewlett-Packard. Other books include Beyond Entrepreneurship (1995), Built To Last: Successful Habits of Visionary Companies (2004), which has sold over a million copies, How The Mighty Fall (2009), and Great By Choice (2011).